Produttori del Barbaresco is one of the few estates in the world that continues to produce fine, age worthy wines at consumer-friendly prices. Although the Produttori’s Barbarescos - the Riservas in particular - age extremely well, until recently the wines haven’t been considered collectible. Because of their reasonable prices, most of the wines have long been drunk up by the estate’s loyal supporters, making older vintages nearly impossible to source, even in the secondary market. This tasting provided an extraordinary opportunity to get a progress report on 21of the estate’s single-vineyard Barbarescos. The wines spanned 5 important harvests; 1996, 1989, 1988, 1985 and 1978, all years Piedmont loves recognize as being among the finest to grace the region. As an aside, I recently re-tasted a number of the Produttori’s 2004 Riservas and promptly augmented my stock of these sublime Barbarescos. I highly encourage readers to snap up the wines while they are around. Managing Director Aldo Vacca was on hand to provide commentary on the wines, and his soft-spoken yet passionate delivery - intermingled with a healthy sense of humor - in many ways embodied all of the qualities of that make the wines themselves special. 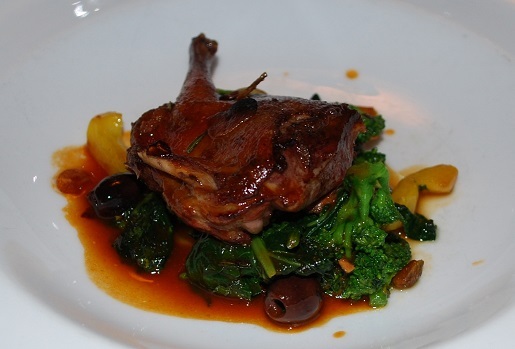 Convivio’s Executive Chef Michael White presented a knock-out menu to match the wines. 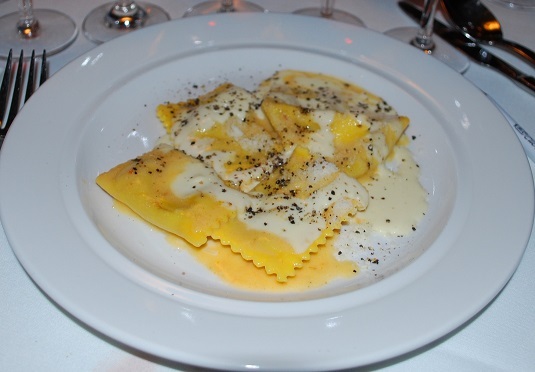 The pastas in particular were exceptional, but all of the dishes were to die for, not to mention that they were exquisite with the wines. This was my second great dinner at Convivio within the last few months. Given the quality of the food, I was not surprised to see the dining room completely packed despite the challenging economic environment. The tasting was organized by the Rare Wine Company, which deserves to be recognized for its dedication to delivering value to the consumer. At $295 per person, this dinner offered an unforgettable food and wine experience at a very reasonable price. One of our wines was clearly corked, but Rare Wine had a backup ready to go. Readers who attend tastings on a regular basis will recognize how unusual this level of professionalism and attention to detail has become. All of the 1996 Riservas showed beautifully. It was hard to pick a favorite among this first set of wines. For the most part 1996 Barbarescos remain young, and still offer considerable upside potential. The 1996 Barbaresco Riserva Rabajà was the most complete of these 1996s, though, and it totally won me over with its explosive kaleidoscope of aromas and flavors. A young, vibrant wine, it promises to drink splendidly for at least another 20 years, if not more. The 1996 Barbaresco Riserva Ovello offered up an array of violets, spices and dark fruit. Still quite young, the Ovello is another wine that needs further time in bottle, but its qualities were easy to appreciate, even at this adolescent stage. Perhaps the most immediate and enjoyable wine of the flight was the 1996 Barbaresco Riserva Pora. The Pora vineyard is one of the warmer sites of Barbaresco given its proximity to the Tanaro River, and in the cool 1996 vintage the wine benefited from an extra touch of heat which is felt in the wine’s plumpness. This was a deep, earthy Barbaresco imbued with notable power married with considerable roundness and sweetness. The wine’s balance and sense of harmony was superb. The 1996 Barbaresco Riserva Pajè combined elements of the classic austerity of the Rabajà and Ovello, but in a more linear and ethereal style. Sweet spices and menthol lingered on the finish in this beautiful Barbaresco. Our flight of 1989s was equally inspiring. If well-stored, the wines can still improve over the coming years. With one exception they were all gorgeous on this night. The 1989 Barbaresco Riserva Ovello was extraordinary. This big, rich, full-bodied wine had filled out beautifully in a surprisingly round style for this site and vintage. It was striking in every way. The 1989 Barbaresco Riserva Pora was relatively advanced by comparison, with tertiary notes of beef, earthiness and barnyard dominating its profile. The wine compensated for its slightly rustic qualities with a soft, generous feel and was far more enjoyable when tasted alongside food. The 1989 Barbaresco Riserva Asili was simply beautiful. This was another kaleidoscopic, multi-dimensional wine that floated on the palate in a textbook expression of sweet perfumed fruit, roses and spices. Simply put, this was classic Asili at its very finest. The 1989 Barbaresco Riserva Montestefano, tasted from magnum, was packed with the essence of tar, beef bouillon, mushrooms, menthol and spices. The wine never came together in the glass, though, and was a bit disjointed. I am not a huge fan of the 1988 vintage in Piedmont as many wines have aged relatively prematurely, but that is not the case here. 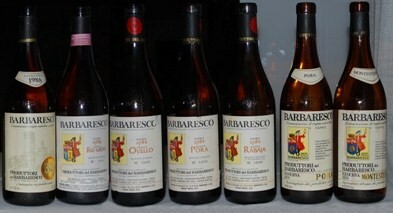 To be sure, 1988 is a relatively small-scaled vintage, but these Barbarescos were all very fine. The wines seem to have exhausted their potential for development, but they aren’t tired at all and should continue to hold for a number of years. The 1988 Barbaresco Riserva Rio Sordo showed the tell-tale qualities of this site in its sweet spices, flowers and menthol. This delicate, medium-bodied Barbaresco has aged exceptionally well, and on this night it was sublime. The 1988 Barbaresco Riserva Pajè, on the other hand, was far more extroverted, as layers of plums, violets and spices emerged in striking style. Still deeply-colored, the wine revealed tons of length and a pure, resonating finish. The 1988 Barbaresco Riserva Moccagatta was pleasing for its round, accessible personality. Though not terribly complex, the wine showed lovely balance and harmony. Sadly, the 1988 Barbaresco Riserva Asili was flawed and therefore impossible to evaluate. This flight of 1988s closed with the 1988 Barbaresco Riserva Trentennio, a special bottling the Produttori released to commemorate their 30th anniversary. The wine is a blend of fruit from the Pora, Montestefano, Moccagatta and Ovello vineyards. It was a pretty Barbaresco, yet it came across as somewhat simple and advanced compared to the other wines in this flight. The 1985s made for a fascinating comparison, as they were made by an oenologist who lasted all of two years at the property. Fermentation and maceration times were considerably shorter than what was customary before and after, and this change in winemaking techniques, along with the warm vintage, made for a set of Barbarescos that lacked the complexity of the estate’s finest wines. That said, all of these 1985 were at peak, and we caught them at an optimal stage in their development. The 1985 Barbaresco Riserva Ovello was rich, round and sweet. Tar, roses and licorice were among the nuances that flowed from this generous, inviting wine. The 1985 Barbaresco Riserva Pora was similarly soft and sweet, with notes of leather, spices and dark fruit that came together nicely in the glass. The 1985 Barbaresco Riserva Rabajà was big and powerful yet despite its impressive fruit, the wine lacked the delineation of the finest vintages. 1978 is of course a legendary vintage in Piedmont and well-kept bottles still deliver the goods. A hot summer followed a cool spring in which yields were lowered dramatically by an irregular fruit set, resulting in some of the most powerful and age worthy wines that have ever been made in the region. This was an incredible flight with which to close out the tasting, even if two wines were flawed. The 1978 Barbaresco Riserva Pora was a grand, sweeping Barbaresco loaded with dark fruit, flowers, earthiness, spices and licorice. Slightly advanced aromas suggested this wine was at peak. This bottle was a treat as it was totally complete, even if some rustic elements came through from time to time. The 1978 Barbaresco Riserva Montefico was awesome. This big wine revealed tons of fruit in a dense, powerful style. The 1978 Barbaresco Riserva Rabajà, possibly the estate’s most legendary wine, lived up to expectations, and then some. Its fireworks were on full display as sweet layers of ripe, dark fruit emerged with seemingly no end. Mentholated, balsamic notes lingered on the long finish in this extraordinary and sublime Barbaresco. Unfortunately our 1978 Barbaresco Riserva Rio Sordo and Barbaresco Riserva Montestefano were both in less than perfect shape, but I consoled myself with an extra taste of the other wines in this magical flight.